Hello my friends! 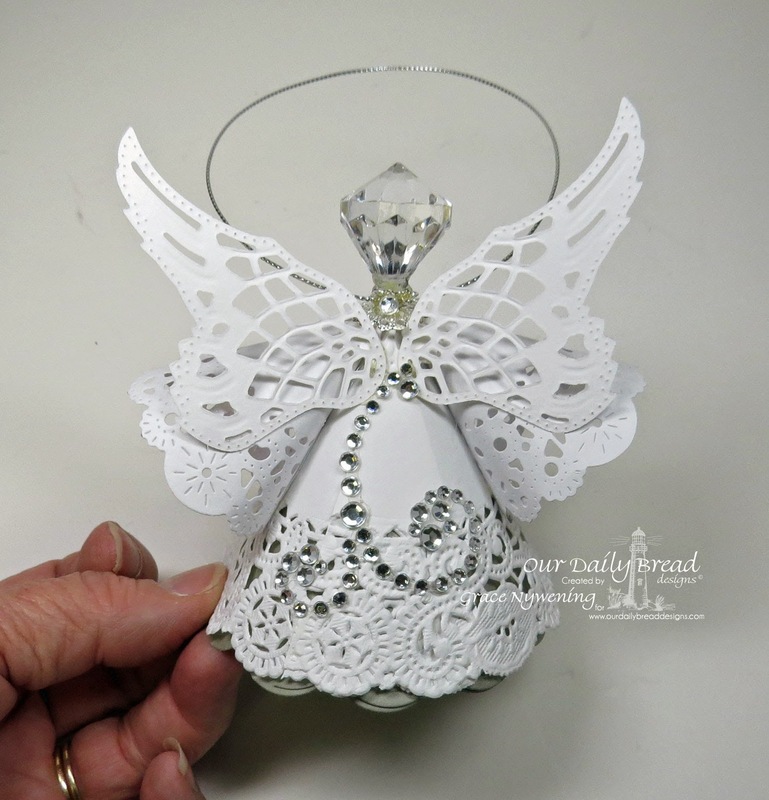 Today I have a fun little tutorial for you on how to make this sweet little angel ornament! I hope you'll give it a try and have as much fun with it as I did! I'd love to see what you come up with! You can email me a picture at my email me link in the left side bar if you don't have a link to a gallery or blog to share with me. 1. Cut platinum or silver card stock with Spellbinders Grand Circle or Scalloped Circle Die. 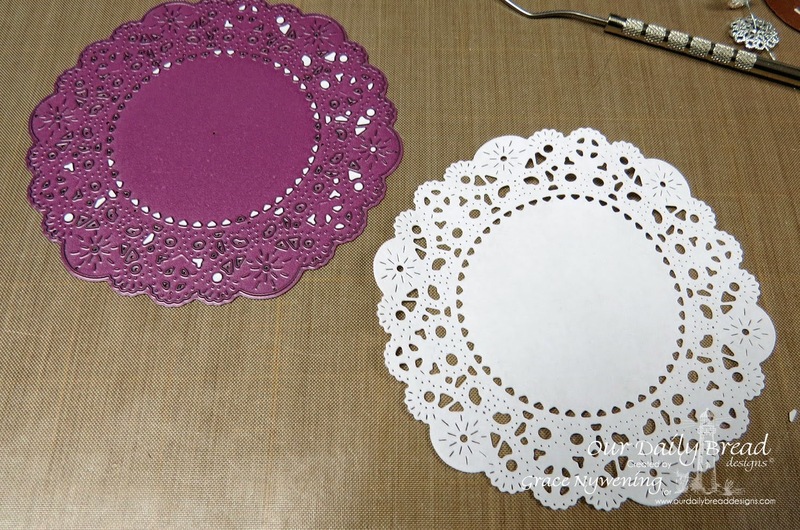 (If you don't have the Grand Circles, find a plate about 6.25" wide and trace around it and hand cut the circle. This layer really does not show much, just a little silver shows through your doily, but it gives rigidity to the ornament. The ones that are just made out of doilies seem to smoosh very easily. Also note... the exact measurement is not critical. If you have something a little smaller or a little larger, it won't make a big difference. 2. Find the center of your circle (I measured and drew lines on the back side to find the center). 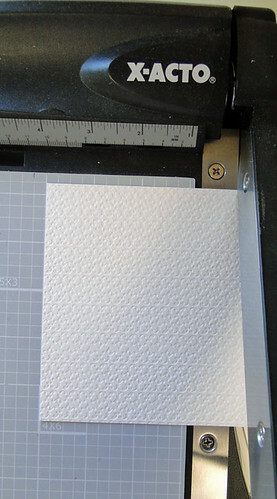 Cut one fourth of the card stock away. 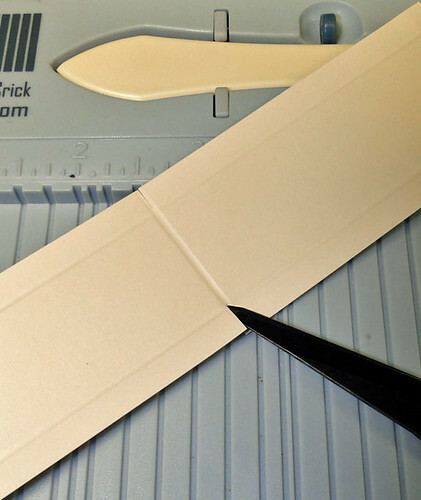 Add adhesive to one edge as shown. 3. Adhere the adhesive end over the other end, forming a cone and matching scallops if you used the scalloped die. I used adhesive strip, but I also added a thin line of TombowMono Metal glue right to the edge so there was o curing up. I used clothespins to hold until it was dry. 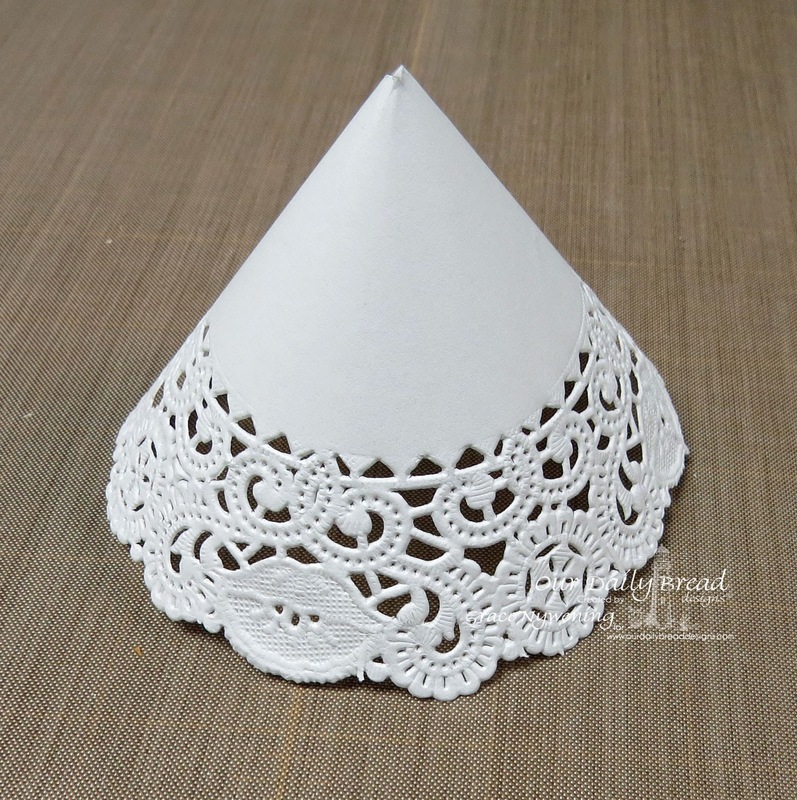 4.Do the same with the 6" Doily. 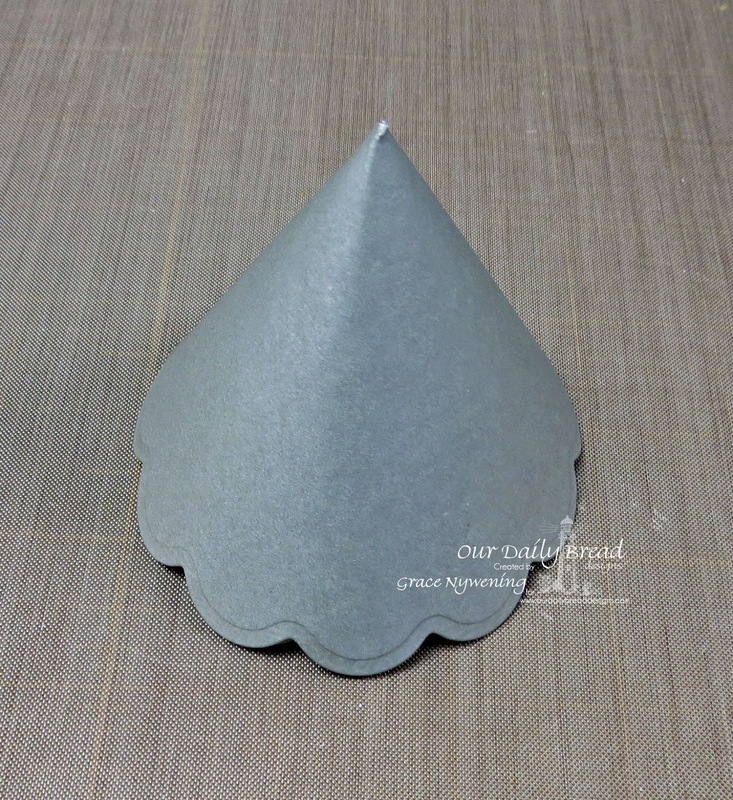 You want to make the cone over top of the base cone so you know it fits nicely on top. (Again, size is not critical as long as it will fit over the base you created). 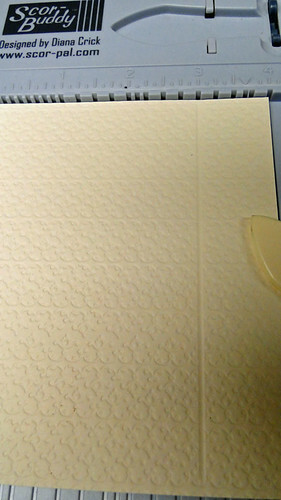 You can cut off any extra overlap if desired, or simply match patterns and overlap any extra. 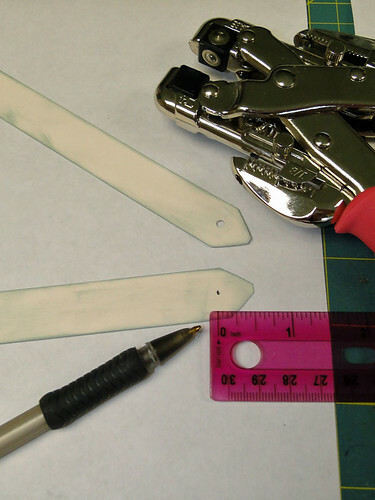 I cut off my extra, leaving just enough for good adhesion in an overlap. 5. 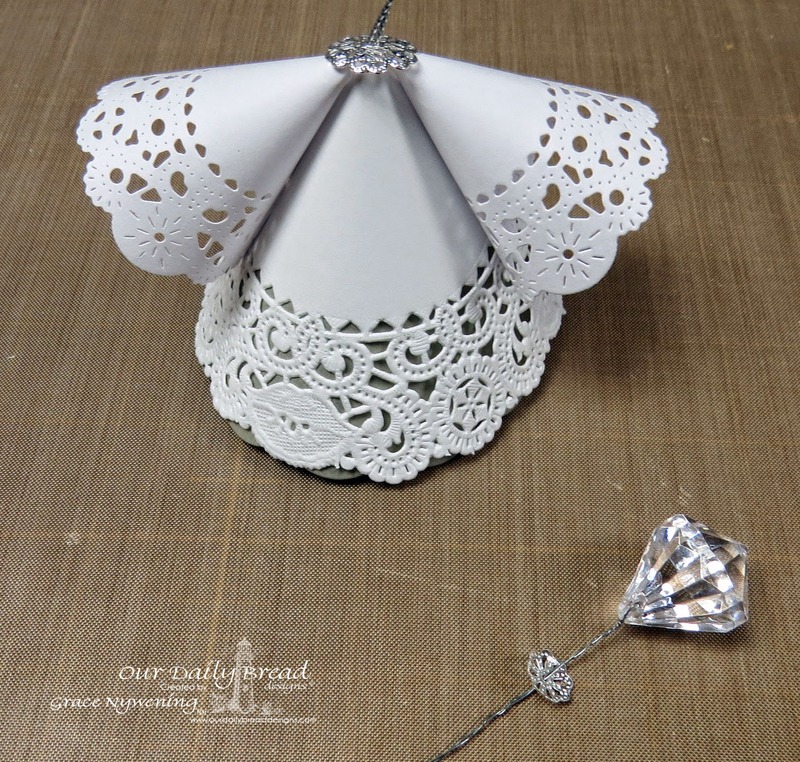 Place a dot of adhesive on the back of doily inside cone, to hold it to the base cone, but not much is needed as we will hold it together with the bead at the top later. 6. 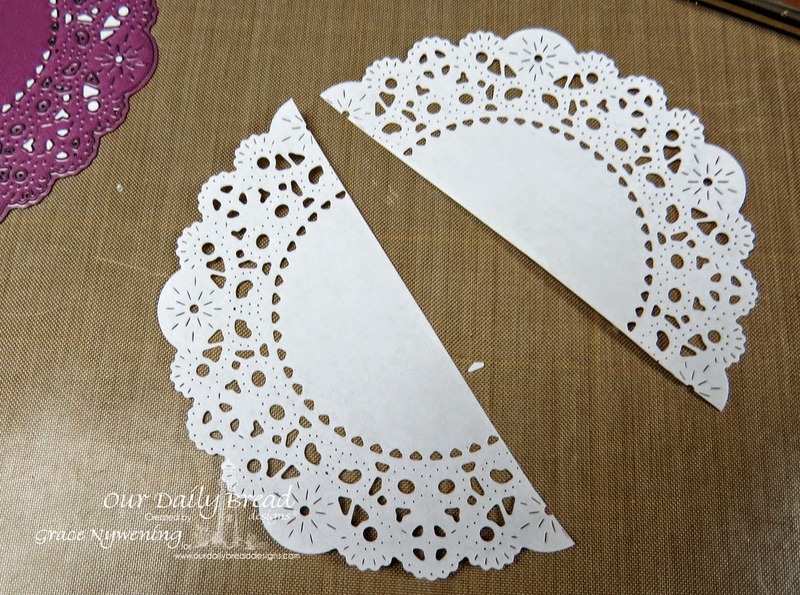 Cut 1 Cheery Lynn French Doily from copy paper, and cut in half. 7. 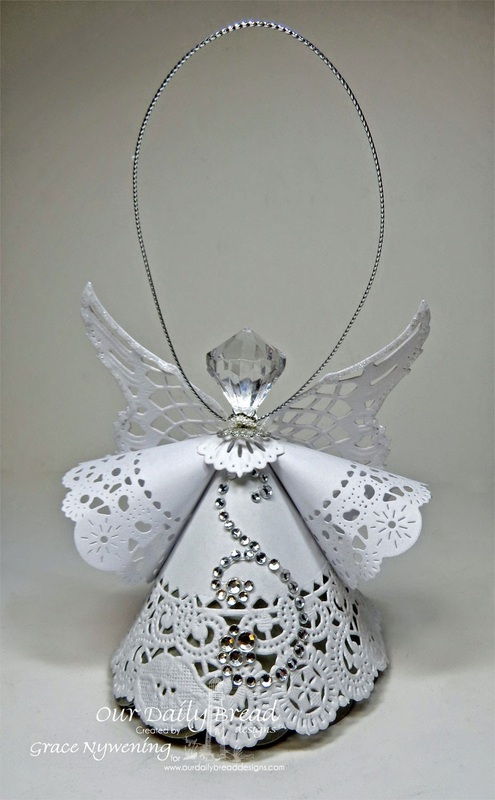 Make 2 small cones for sleeves and adhere to the sides of your angel. I used Tombow Mono Metal glue because it dries fast and holds very well. 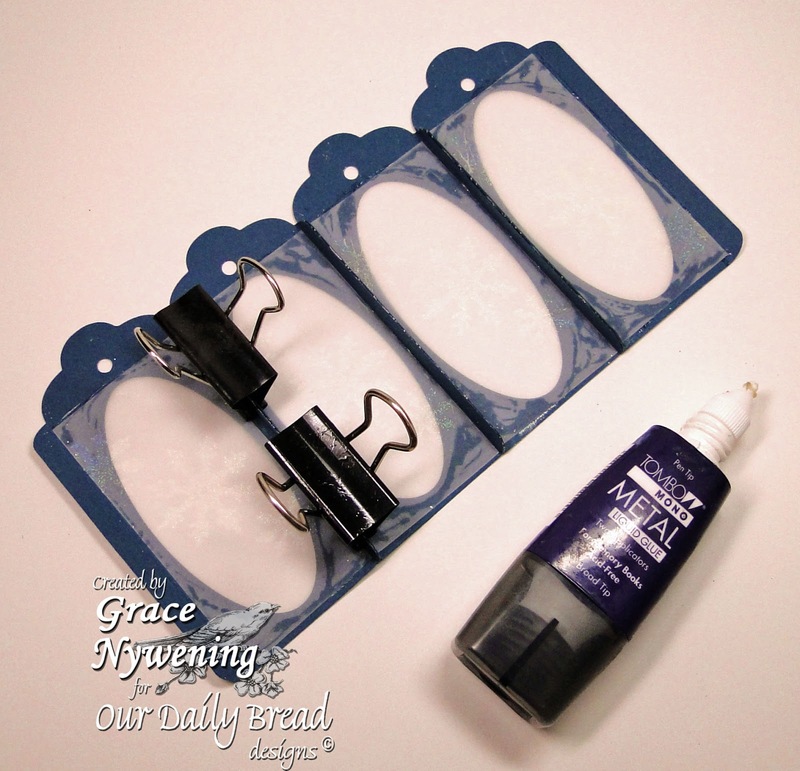 Use clothespins or other clamps to hold in place until glue is set. Sorry I missed getting a photo at this step but you can see in the below photos where the sleeves go. 8. 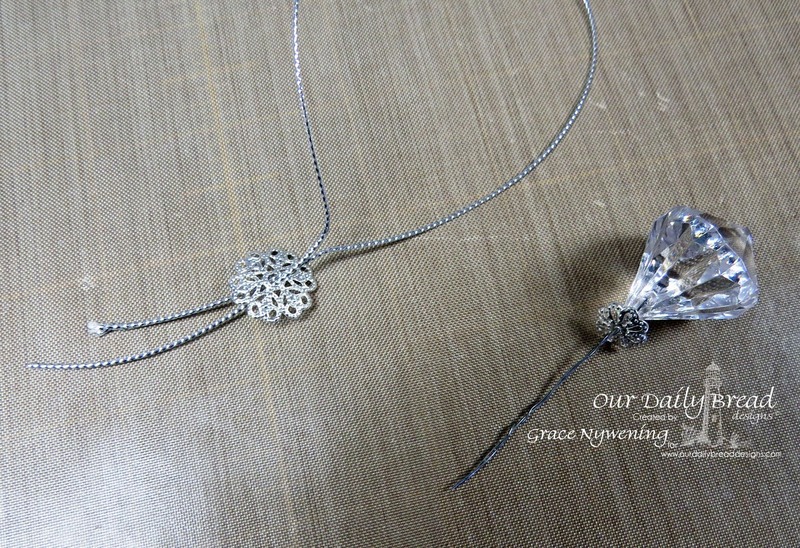 Pass a 4" piece of thin silver wire through large crystal bead, twisting it under the bead and down to the end. 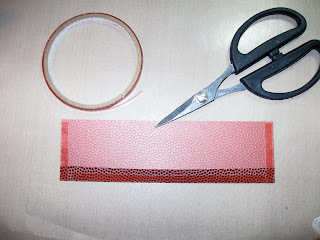 Add a silver bead cap (I used my smaller size here, with the curve facing up as shown below. Cut 8.5-9" piece of silver cord and pass through one of the bead caps in the orientation shown below. (I used the larger one here). 9. 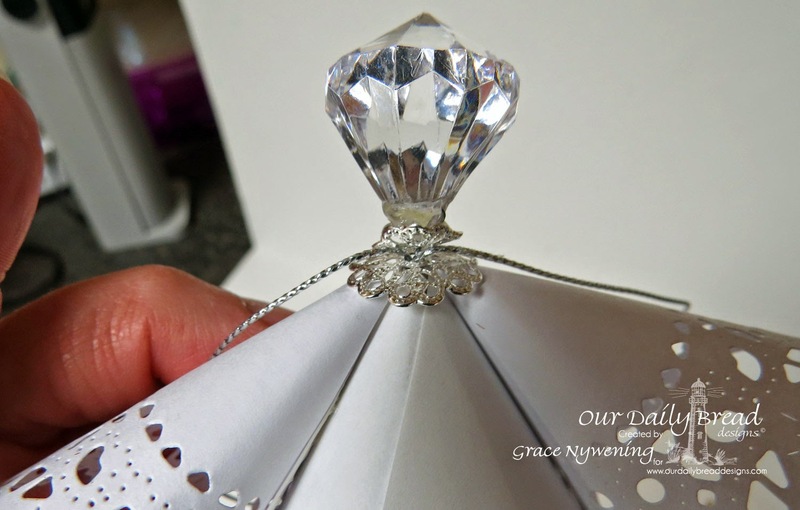 Pass the silver cord with the silver bead cap down through the hole in the top of the cone. If the hole at the top of your cone needs to be a bit bigger, snip off just a tad so you can pass the cord through. You don't need much room so start small and if you need more you can always take more, but try to keep the hole as small as possible while still allowing you to bring the cord trough. 10. Pass Crystal bead with wire and small cap down through the center of the other larger bead cap, spreading the silver cord so it comes out to the sides (one on each side) of the crystal bead. 11. Tie a knot in the silver cord near the end on the inside of the cone. 12. While holding the cord in the position you want it to come out (on each side of the crystal bead head), add a good blob of hot glue right up in the top inside of the cone. While it's still soft, position cords and bead as desired. The hot glue when dry does a good job of holding this position if you have enough to completely surround the wire and cord. 13. 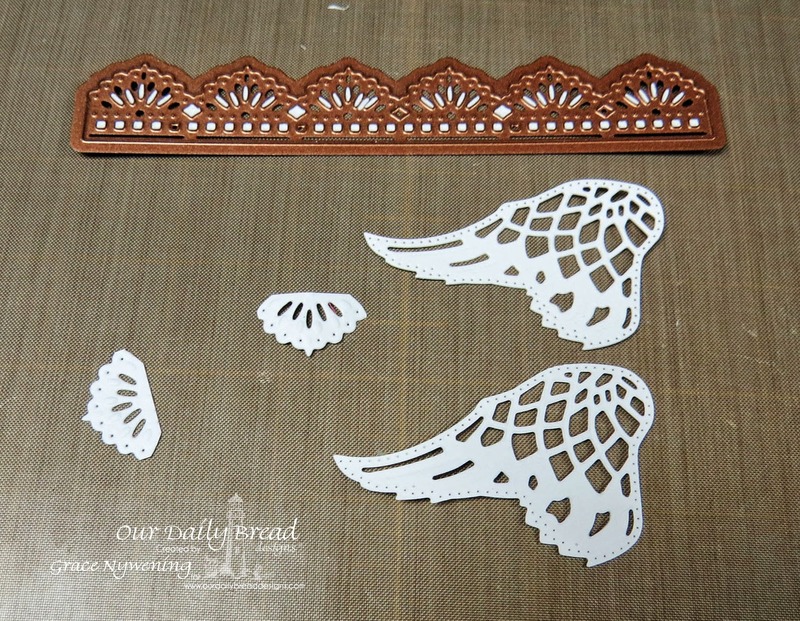 Cut 2 Angel Wings and one Beautiful Border with the ODBD dies, from white card stock. 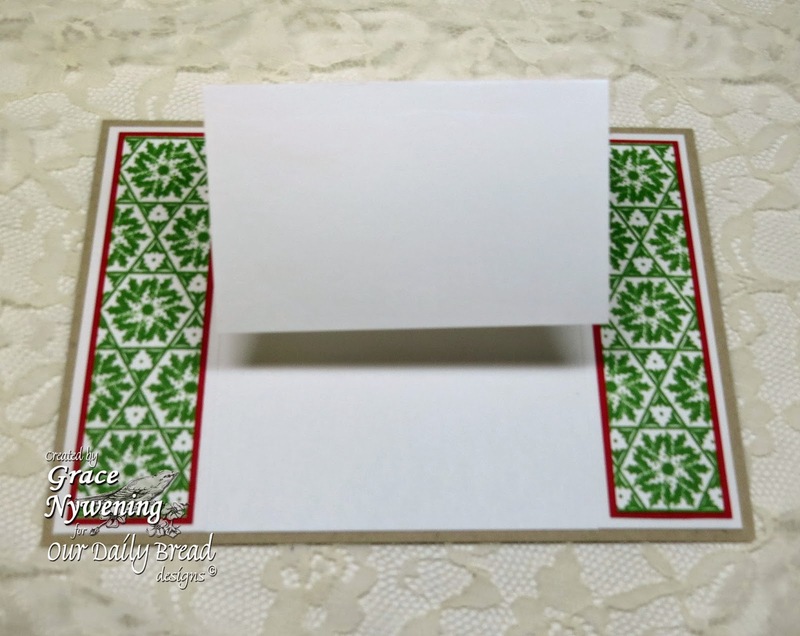 Cut off just 2 sections of the beautiful border, and save the rest for a card or different project. 14. Adhere one piece of the border at neckline in front, and one at back. Adhere wings to back of angel and sleeves as shown below, using the Tombow Metal glue. Now you can decorate as desired. I used Recollections crystal bling and put one flourish on the back, and one on the front. I added Stickles to the wings for some sparkle. This brings to mind a Psalm that reassures us of God's protection and watch care over us, if we know Him and place our total trust in Him. It blesses my heart every time I read it. I have entered this in this week's Shining the Light Challenge, which is "Wing it". You still have a couple days to play along and possibly win a prize! Thanks so much for stopping by! I hope you enjoyed this little project and were blessed as well! Hello friends! Today I have something fun to share with you! I have never made one of these center easel cards before, but I have seen a couple on Pinterest, and decided to give it a try. I love how it came out! I could not find a tutorial for this fold, so I tried to describe below how I created this one. 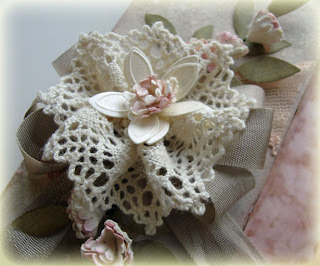 I was not thinking of a "tutorial" when I created it, so I did not take photos along the way until near to the end. So, instead, I drew a diagram and I hope that helps explain the process. I started out with a 5 x 7" base of craft card stock. 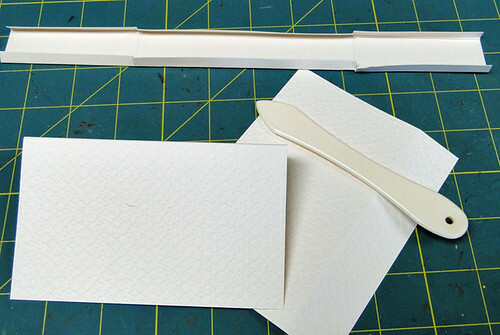 Then I cut a piece of white card stock 9 1/2 x 6 3/4" and scored it to fold it in half (at 4 3/4"). 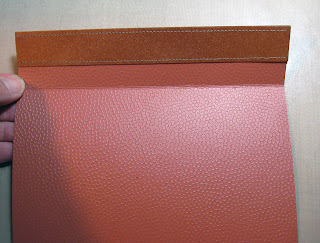 On one half of the center fold, I cut to the center fold line at 1 7/16" in from each side. On the center panel between those two cuts, I scored across the panel at the half way point. This forms the easel to which I will adhere the center panel of my card. 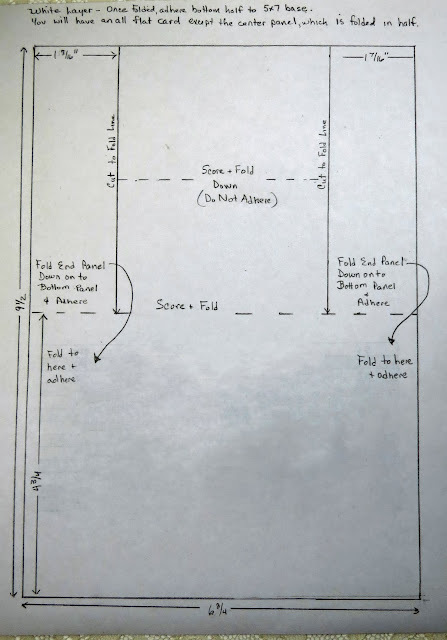 Here is the diagram of the fold and cut lines. Sorry the lighting is not the best, but I think you can get the idea. 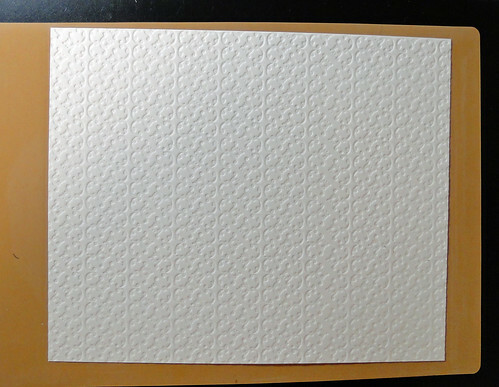 After the two side panels of the white layer are adhered down on the bottom white half of the card, and the center panel is folded in half, you adhere the solid half (the 6 3/4" x 4 3/4" white panel to your 5 x 7 Craft base. 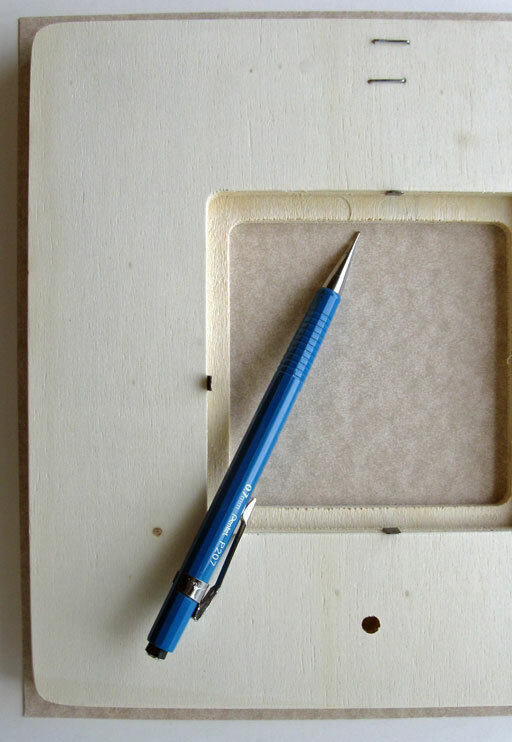 As you can see, your folded center panel is now going to form the easel that will hold up your main panel. 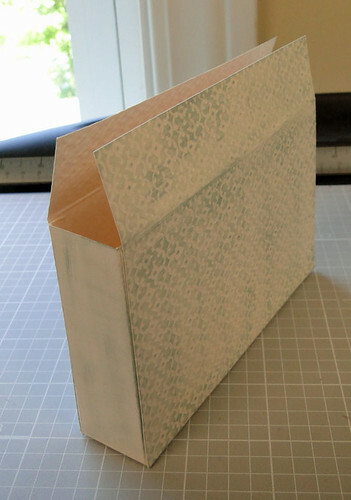 To adhere your main center panel to the easel, I find it easiest to apply adhesive to the lower half of the folded white panel (see photo above), and lining up the lower edge of your decorated panel where you want it, adhere. You will then have the easel, which is only adhered to the bottom half of the main panel, which allows you to fold the card flat for mailing. See below how it looks from the side once adhered. 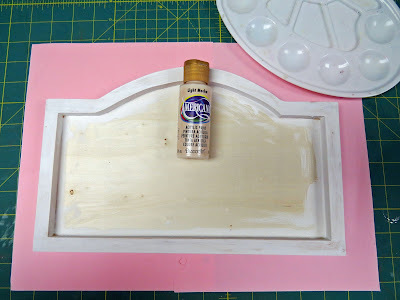 It's also a good idea to put either pearls, flowers or some other decoration on the lower edge of your base to form a "stop" for your main panel to rest against when it is open. 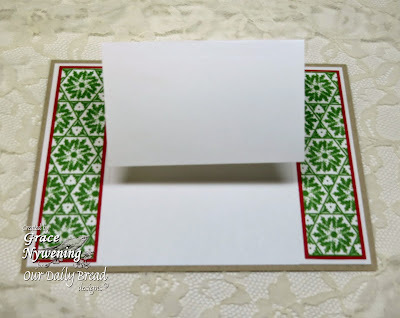 As you can see, I used a Spellbinders tag die cut and a stamped sentiment, which is all that's needed to hold the easel up, but not bulky when you want to fold it flat for mailing. 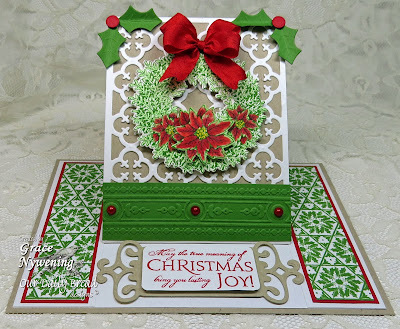 Other: Craft, White and Real Red card stock, Real Red and Gumball Green Ink, Copics, AnnaGriffith Cuttlebug embossing folder, Red pearls(Michaels), Red Ribbon (May Arts), Dimensionals. 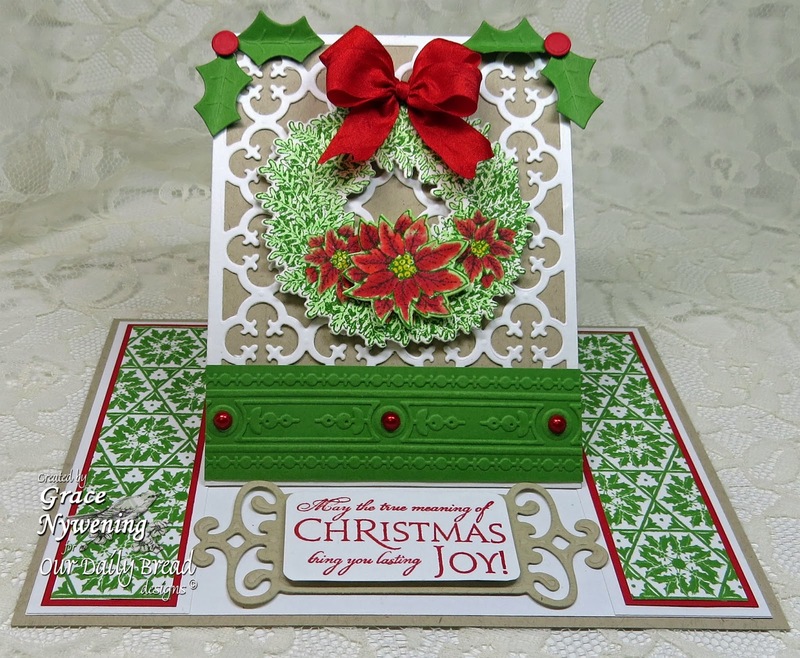 I stamped the holly pattern with Gumball Green, matted with red and adhered to the two side panels. 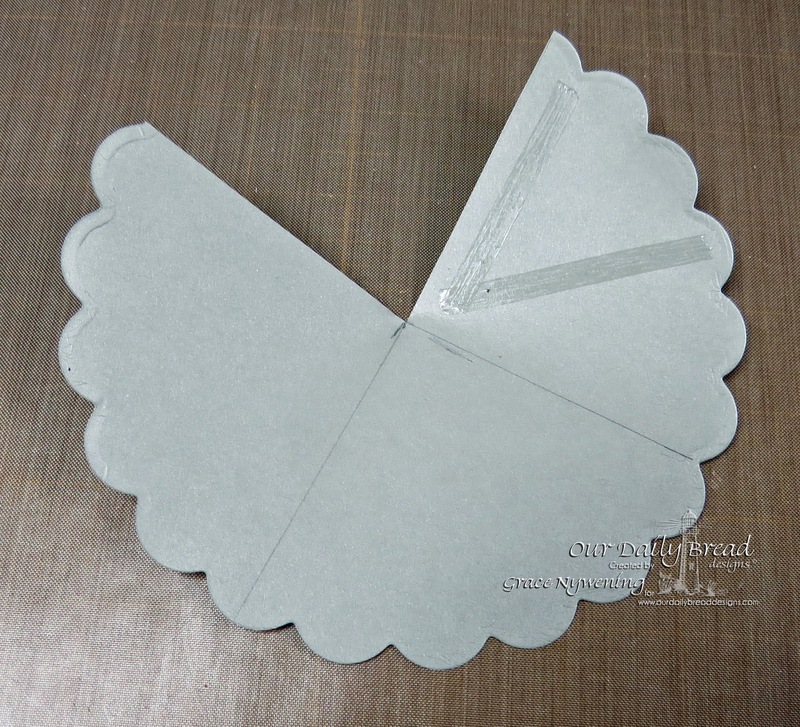 I die cut the Quatrefoil Pattern from white, cut a craft panel the same size to back it with, and adhered them together, and then adhered the bottom half to the front fold of the center folded panel. 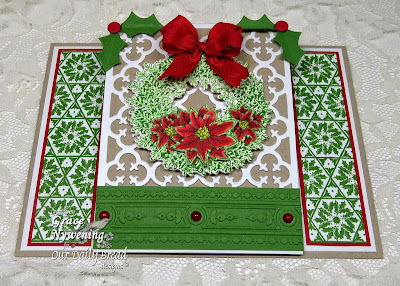 I stamped the Poinsettia Wreath with Gumball Green and then lightly colored with Copic G40. I colored the poinsettias with Copics R24, R29, Y15), cutting one extra with the Poinsettia die cut so I could pop up the center flower. I cut the green panel, embossed with the Anna Griffith folder and adhered to the bottom of my center panel, and added the pearls. 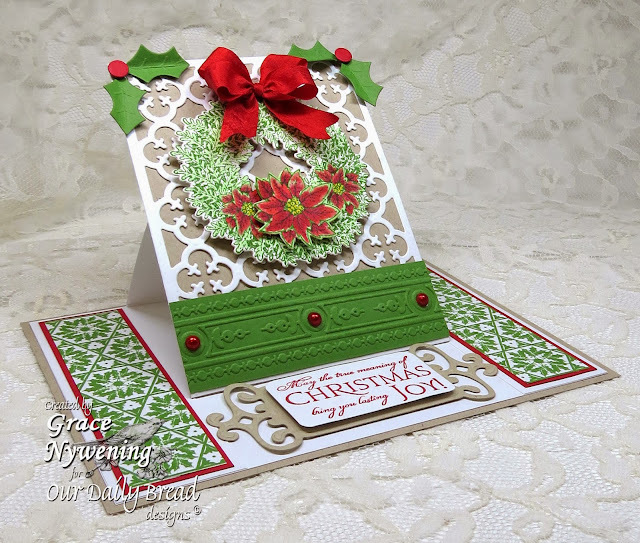 I added a bow to the wreath, and die cut some holly leaves and berries from the Circle Ornament Die set I stamped the sentiment from Christmas Blessings with Real Red on white, and cut with a SB Fancy Tag. 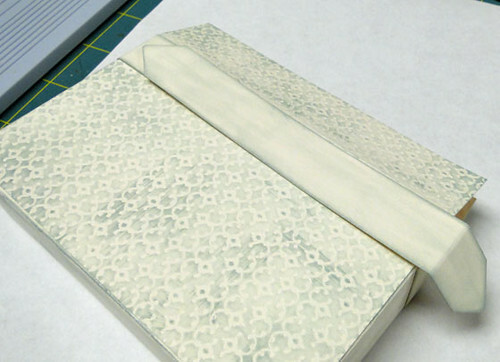 I hand cut along the embossed line so only the white inner part would be used. I then cut another fancy tag from craft and mounted the white panel to it, and popped that up with 2mm dimensionals. This gives a stopping point for the easel to rest against when open. 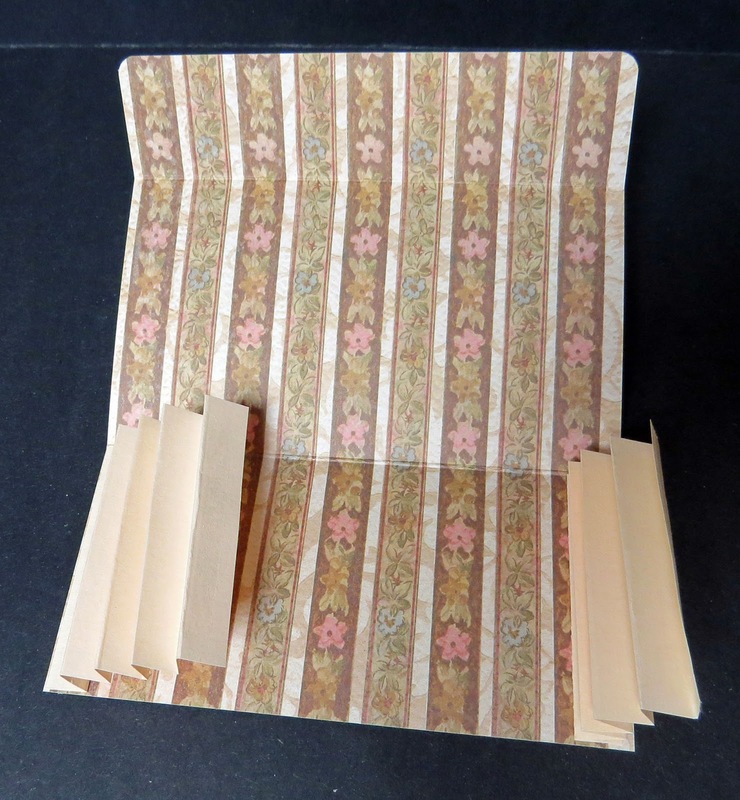 When it's ready to be mailed, it folds down flat. Thanks so much for stopping by today! I hope you enjoyed my project and will give this a try! You could use any dimensions you wanted! You don't need to use the same size I did... just play with it and I think you'll love the result! It's a fold that gives a little wow factor, displays beautifully, but is actually VERY easy to do and is very mailable! 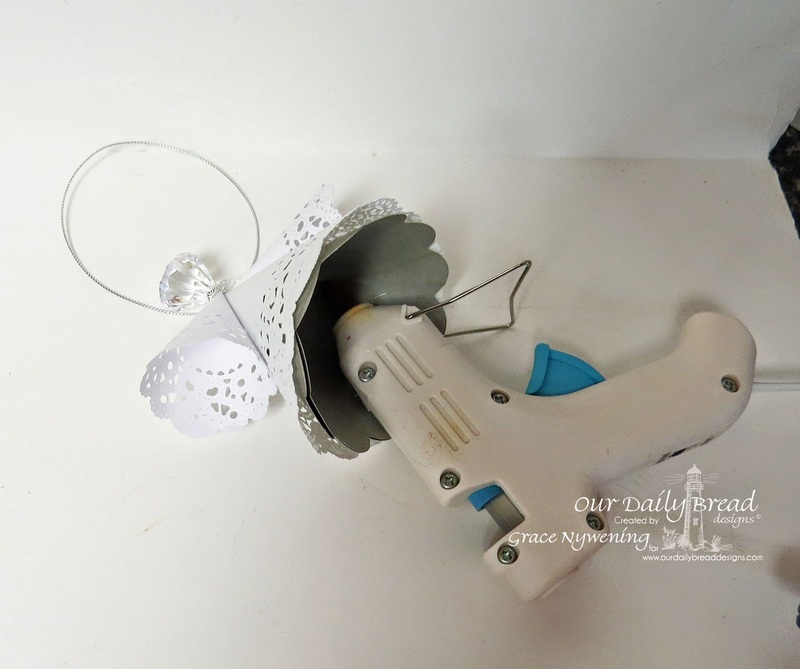 Tutorial to create according fold file, and general instructions for this altered wall art. This project was created for my Time With post on ODBD HERE. Papers: My Mind's Eye Bella Bella, Crafty Secrets double sided, K&Co Brenda Walton, Cream Card Stock, Light weight paper for accordion fold in coordinating color, paper doily. Inks: Memento Black, TH Distress Black Soot Marker, Distress Inks in Tattered Rose, Stormy Sky, Bundled Sage, Brushed Corduroy, Stampabilities Pigment Ink in Light Pink and Baby Blue. Accessories: 2 Laser Cut Wood Birds (Michaels), ODBD Custom Recipe & Tags Die, ODBD Custom Apron, & Tools Die, MS Bough Punch, Corner Rounder punch, Prima and ZVA Creative Flowers, MS string, Recollections Brad, Lace, Spellbinders Back to Basics Tag, hole punch, hot glue gun, Fiskars Finger Blade, Score Pal. 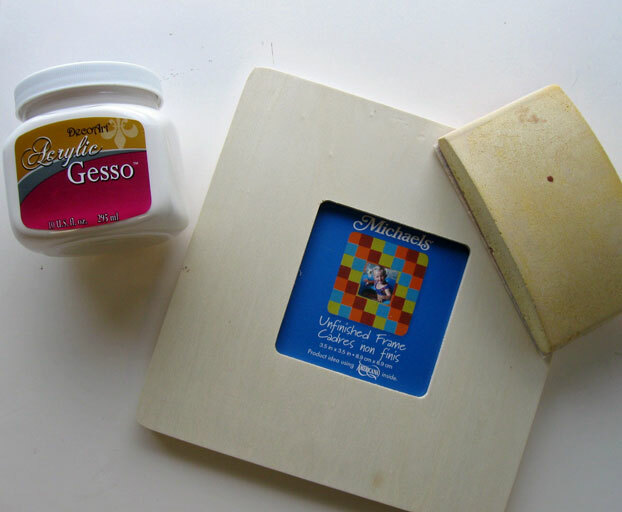 Sand the frame and paint with a coat of Gesso. 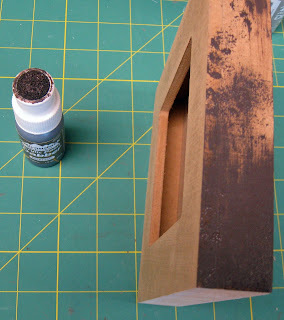 Sand again with fine sandpaper, and then paint with Acrylic Paint of choice. I used Americana Light Mocha. 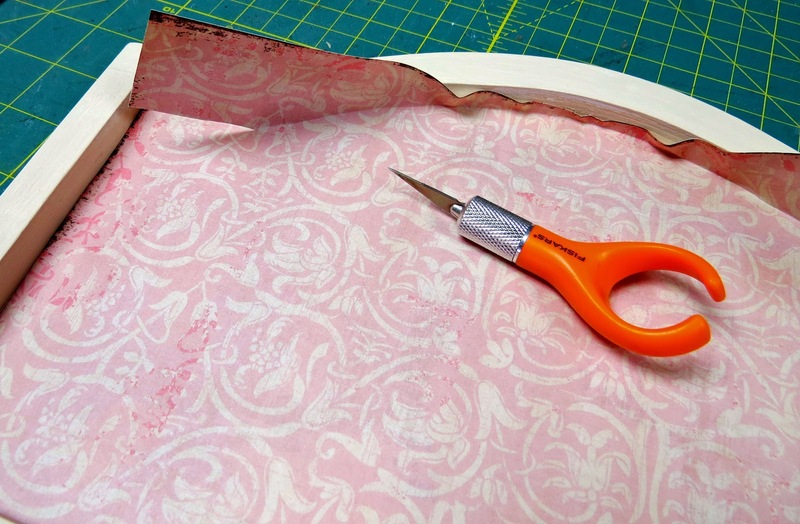 Next I cut the MME Bella Bella paper for the background paper. This is thin paper so I just cut it slightly larger and laid it in the frame, then using my finger nail, I worked it in to the edge of the frame, making a good fold line, and using my craft blade, I cut along the outside edge. I sponged around the outside edge of the dp with brushed corduroy to give an aged effect. I adhered that to the frame. 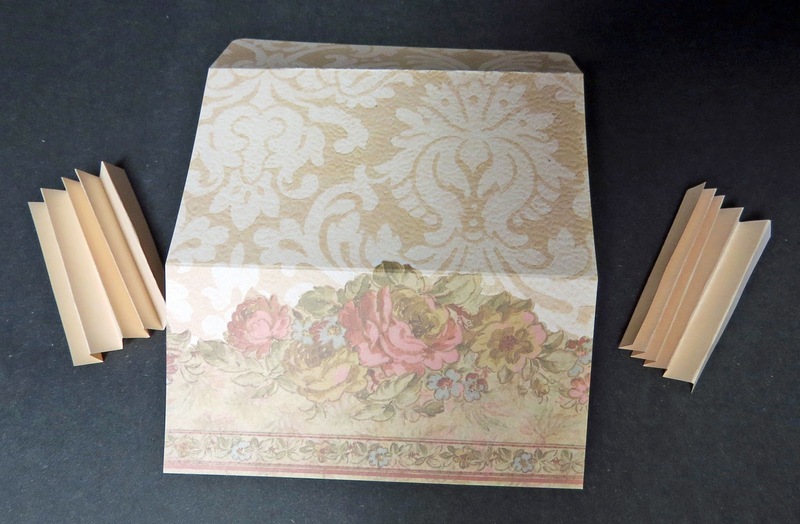 Cut Heavy Double Sided Designer Paper (Crafty Secrets used here) to 8" x 5.5"
Score at 3", 6.5", and fold and burnish folds. With corner rounder punch, round the two top edges on the smallest section (which would be the flap that closes the file). 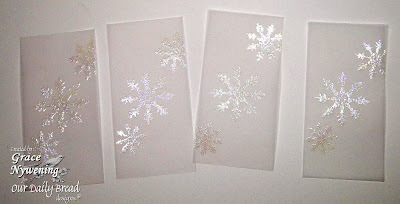 Cut 2 pieces of Light Weight paper (I used light cream copy paper) to 4.5" x 2 7/8". Score at every 1/2" and burnish folds. 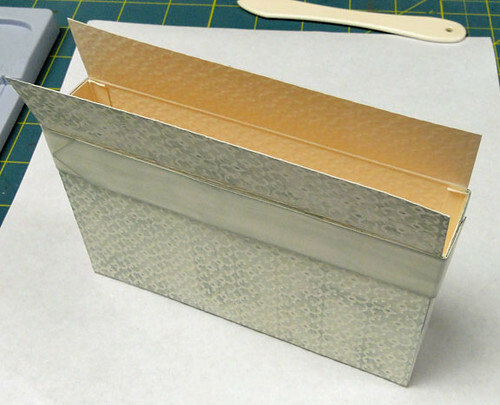 Next, pinch your pleats together and carefully fit into the fold of your folder, and adhere to the next section, creating a closed file folder. 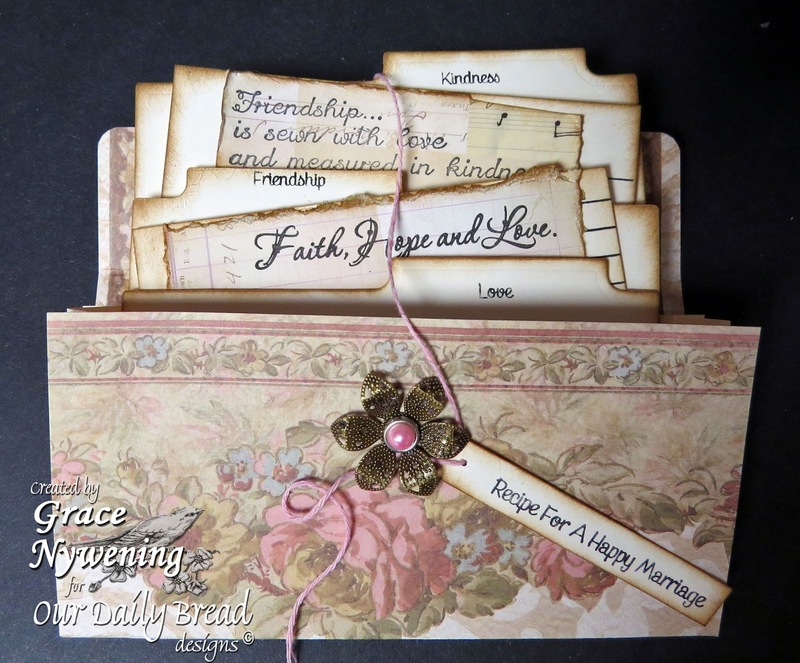 I added a decorative brad to the front, and some twine to the top flap (which is covered up) but I brought that twine down over my files and wrapped around the brad, and used it to tie on my tag on which I stamped the Recipe for a Happy Marriage Label. For the insides, I die cut some tabbed recipe file dividers, and using my THoltz Distress Marker, I colored just the word from the Happy Marriage Recipe stamp that I wanted on my tabs. 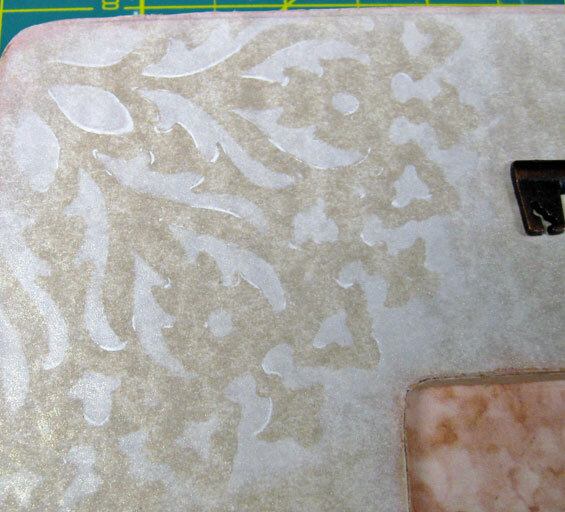 I then stamped the Recipe Lines on cream card stock several times and cut out. 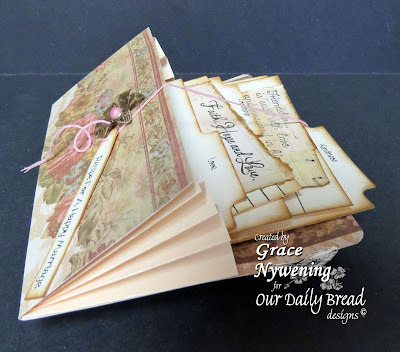 I sponged all the edges with distress inks, and then on K&Co dp, I stamped several sentiments from the above listed ODBD sets that had sentiments that fit my file categories. I tore the edges and adhered to my recipe cards. To assemble, I used dimensional tape, beginning with very thin ones for the first file, and working up in size until the back ones were quite thick. This gave me more of an appearance of depth. That's it for the accordian file! Easy and fun! I then decorated the rest of my frame with a doily, several more ODBD stamped sentiments and die cut tags, and then I added two little laser cut wood birds I bought at Michaels. 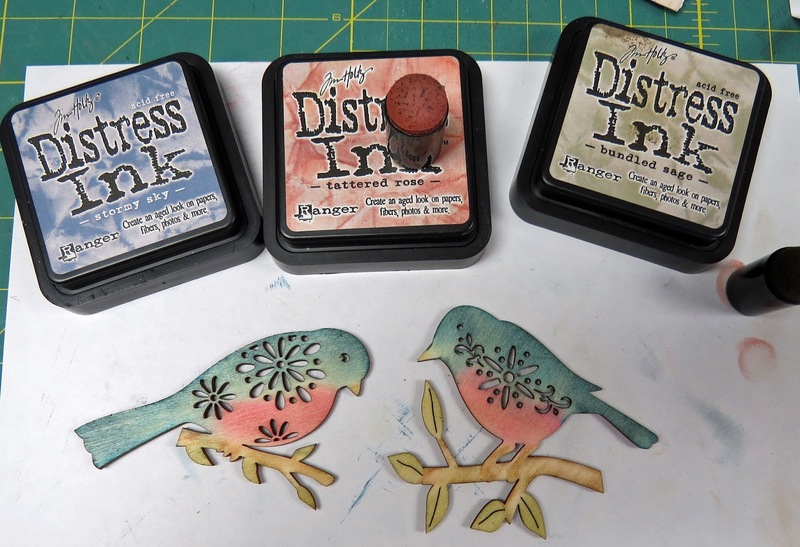 To color them, I simply sponged on various inks, not being too particular about details. I adhered them to my frame with a hot glue gun, and I adhered the string from both tags to the backs of their beaks. I die cut a pocket from the ODBD Custom Apron &Tools Die set, added lace and faux stitching, and tucked the tag cut from the ODBD Custom Recipe Card & Tags Die set in to it, but out enough to read it. To finish it off, I hot glued on several flowers and punched greenery. I hope you enjoyed my project and I hope something I've shared in some way inspired you to try some wall art gifts, or perhaps a cute little recipe file for a few special family recipes you want to pass on to a loved one. I hope you'll tell me what you think and if you try it... do let me know! Thanks so much for spending time with me today!!! That's it! Easy peasy and yet looks very pretty on the tree! I hope you'll give it a try. 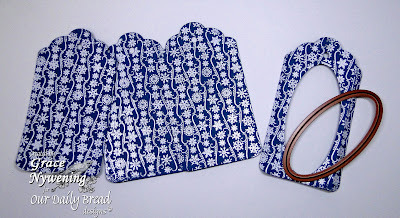 Here is the much requested tutorial for the Picnic Basket I made for the May 1 ODBD Blog Hop. I used a different color card stock this time just to show a different look for it. I hope you enjoy it and find it helpful! With what's left of your 8.5 x 11" cs, cut two pieces about 4 1/2" x 5 1/2". Emboss the two 4.5" x 5.5" pieces with the Vintage Border Embossing Plate. Score these 4 x 5" pieces at 1" along the long side. 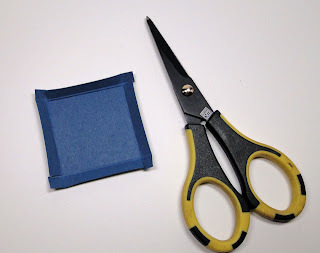 (This will form the fold that goes inside the basket and hides the backs of the brads) So your basket will be 3 x 5" when this 1" is folded inside. 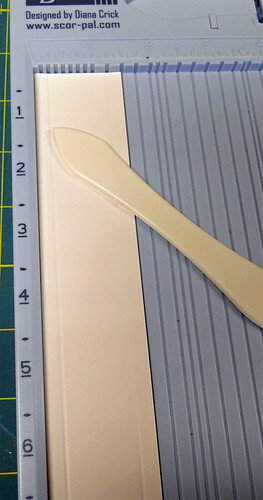 Score the 1.5" x 11" strip along the LONG sides, in 1/4" from each side. If you want to apply any ink to your basket, this would be a good time to do so. I used a 1" cube and applied directly to the card stock, trying for a streaky effect on the solid parts. With scored line at the top of your 4 x 5" pieces, start adhering your 1/4" folds of the 1.5 x 11" strip to the back side of the front and back of the basket. Work one side at a time. (Be sure to use a strong adhesive. I use TomBow Metal as it gives me a little wiggle time, but holds FIRM! It does NOT need much, so don't worry about complete coverage if using the TomBow.) * NOTE: Begin from the bottom of the basket and work up. 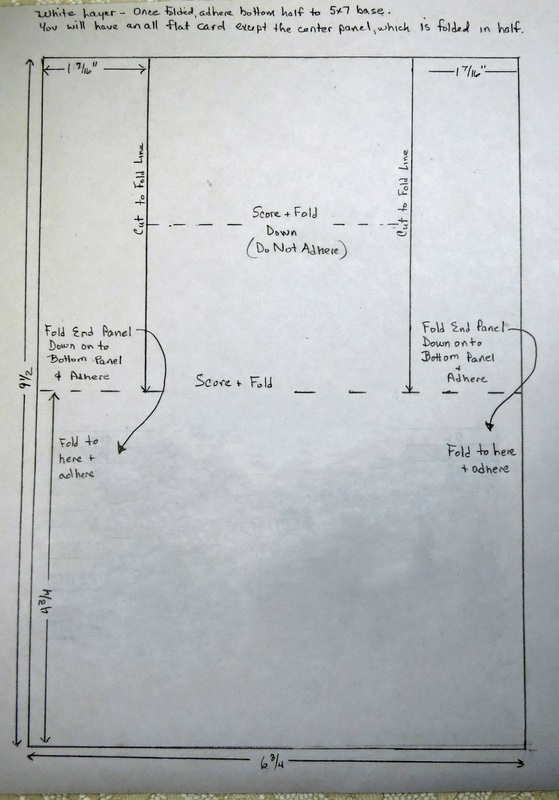 The sides will end at the point of your 1" score line that runs across the top of the basket. Trim the ends of the handles (3/4 x 8" strips) to a point/ or squared off triangle shape if desired. 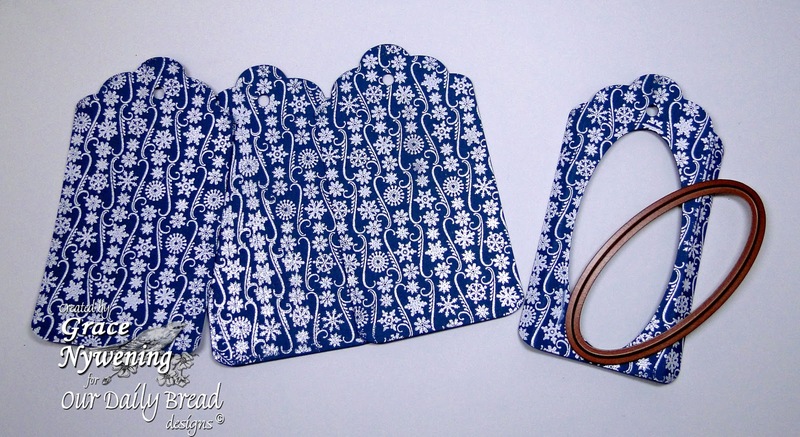 To do this, I draw the shape I want and cut one, then use that one as a template for the others. Trim both ends of the 3/4 x 5 7/8" top strip in the same way. 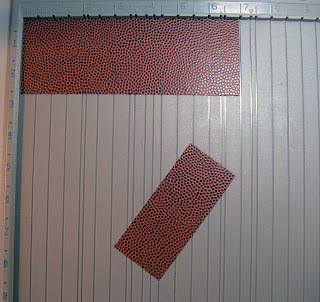 Measure 2" in from both ends of basket, make a tiny mark and punch a hole there on both sides. Put brad through handle, then hole in basket and secure on all four spots. Put brads through each handle and then the basket body, securing on inside. 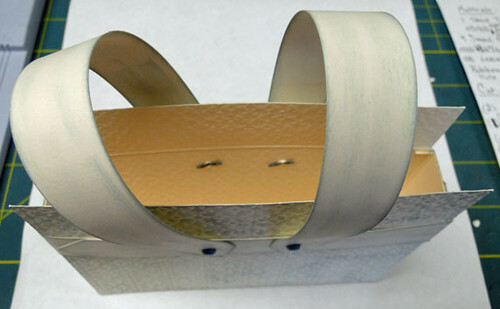 Fold top flap of basket to inside of basket, adhere. This finishes off the inside nicely and covers the brads. 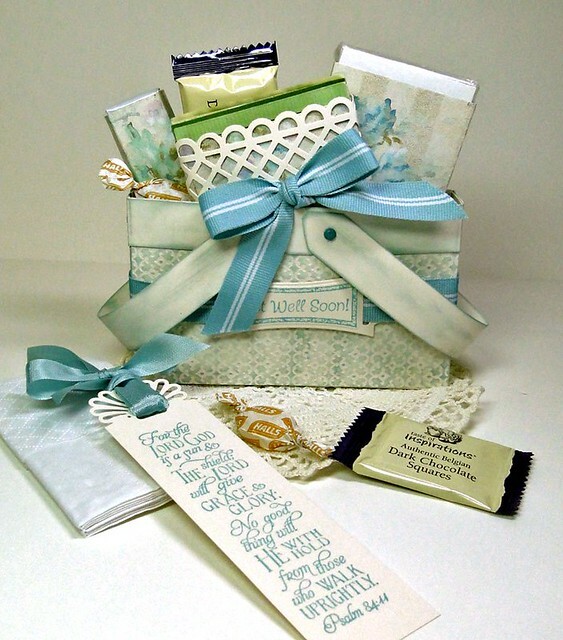 For mine, I decided to make this one a Get Well Basket, so I used Our Daily Bread designs Mini Tags 2, Spellbinders Ribbon Tag Trio Three, Our Daily Bread designs Scripture Collection 6 (for a bookmark I added to my basket). I used SU! Baja Breeze ink and Grossgrain Ribbon, and Martha Stewart ribbon for the bookmark. I used Crafty Secrets designer paper to make wraps for a travel pack of tissues, a bundle of tea bags, and a pack of throat lozenges. I tucked in a few cough drops and some Dark Chocolate to lift the spirits. Here are the pictures of the Picnic Basket I made for the May 1st ODBD Blog Hop. You can see the list of materials for that on this post. 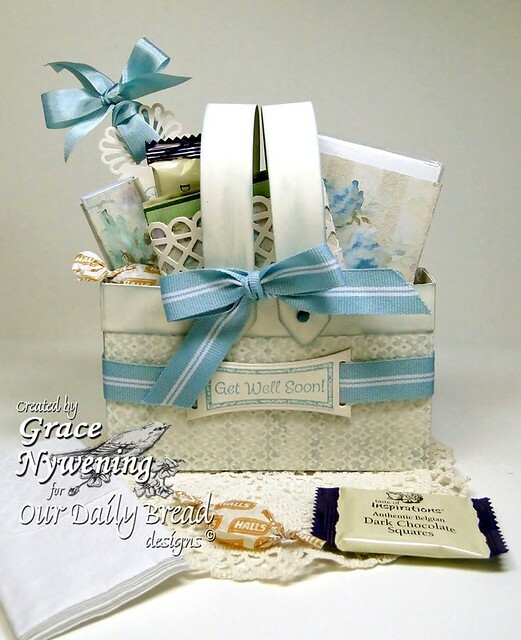 For this one I made Scripture cards for the inside of the basket, and used more traditional picnic basket colors. There are so many possibilities. I hope this has been helpful. If you try it, please let me know so I can see it! Also... please tell your readers where you got the instructions and link my blog. This will be filed on my Tutorials Page. Thanks for stopping and leaving me a comment! It always means so much! I'm honored to have been asked to Guest Design for Sweet 'N Sassy this month, and this card was made with the brand new release, Shining Light. 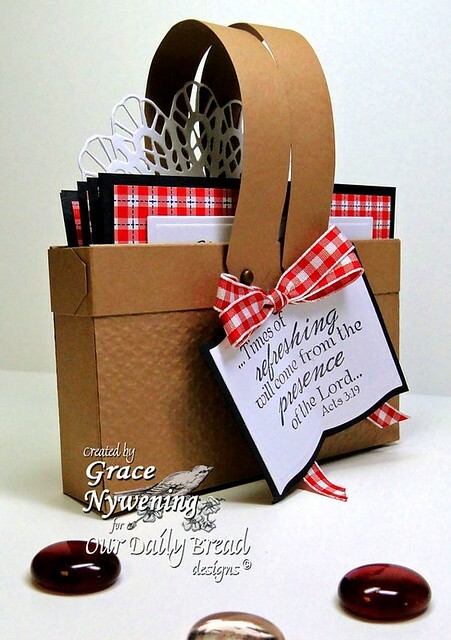 It's a great set with lots of inspirational verses as well as practical sentiments like these two I have used. With Father's Day right around the corner, it's perfect! 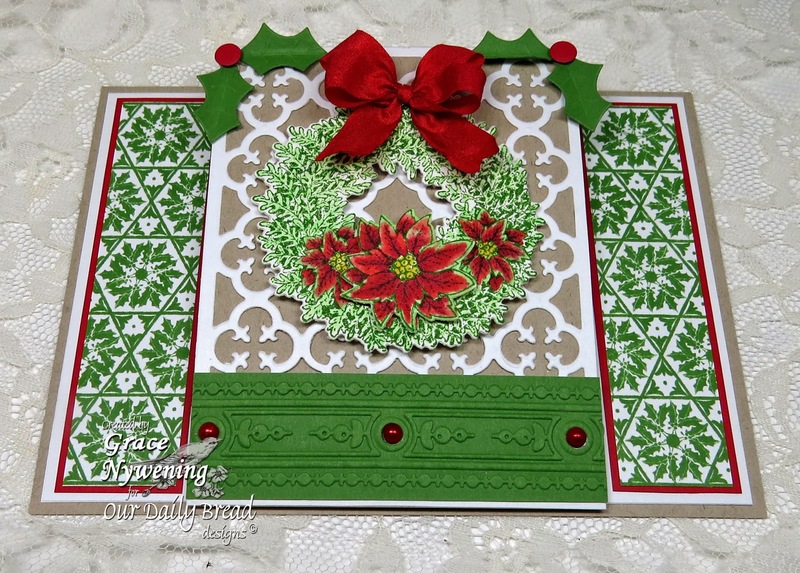 I used the center step card design for this one. 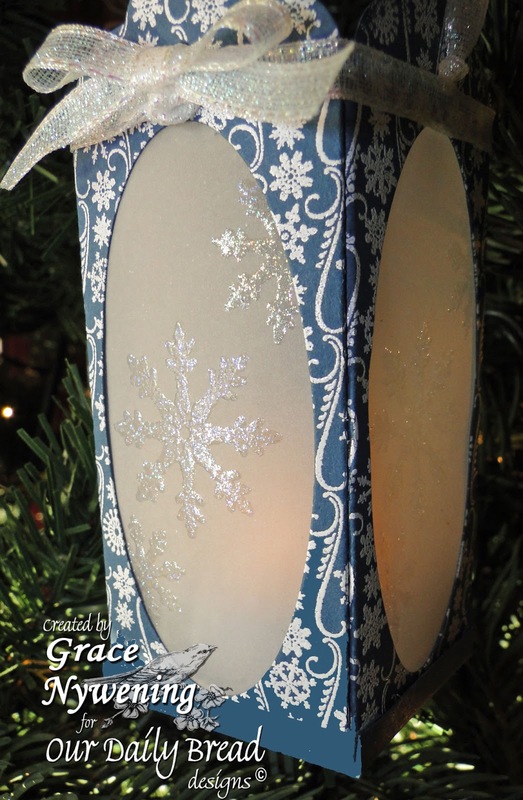 I love this design and find it so fun and easy! I have seen variations of this design all over blog land, but I decided to try drawing the pattern for you if you'd like to try it. It's very straight forward! 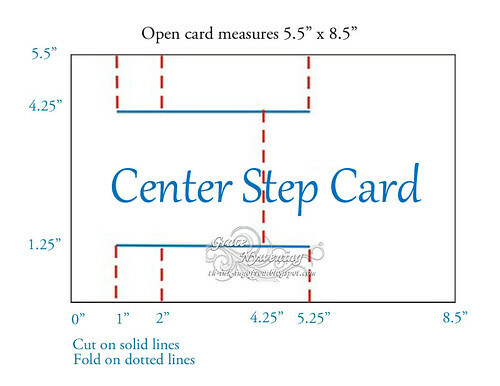 Simply start with a piece of card stock that's 5.5 x 8.5" if you want an A2 card when folded. You could certainly adjust these dimensions easily if you wished. 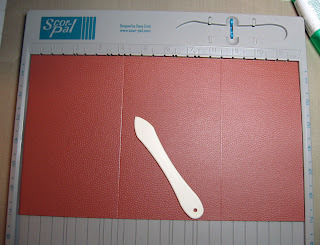 I used a craft blade to cut the inside cuts, and my score buddy to make the score lines. If you make one please link me and let me see what you did!!! Have fun! 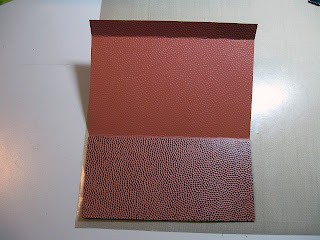 The base is Gina K Tan Leather card stock, the designer paper is K&Co Blue Awning. 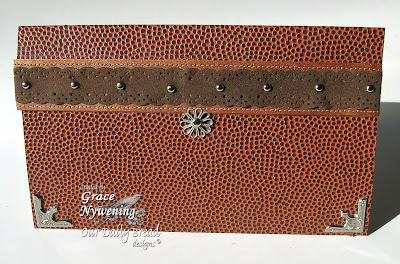 The image is stamped on Gina K Pure Ivory with Memento Ink and colored with Copics. I used my air brush to do the sky, layering on several different colors for depth, but a super quick technique. 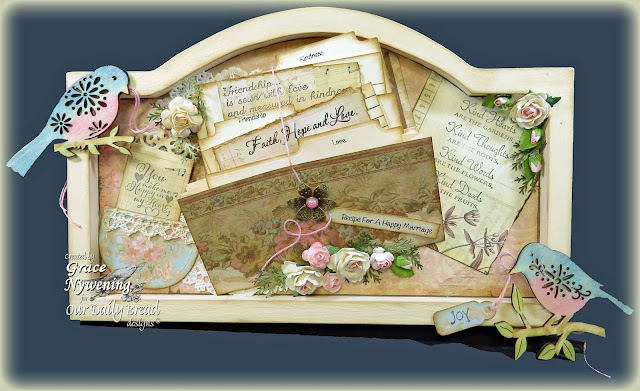 If I didn't have the air brush, I would use chalks and sponge them on around my cloud template by Rosy's Road Show. The key to using ANY template is to keep moving it so the angles of the clouds are not all the same. I often use the template for my first layer, then remove it and color over the white areas with a light color such as W01 or B0000. This gives the illusion of the puffy clouds without having them be stark white, and it allows you to have a more natural feathering of the clouds rather than the real defined scallops. 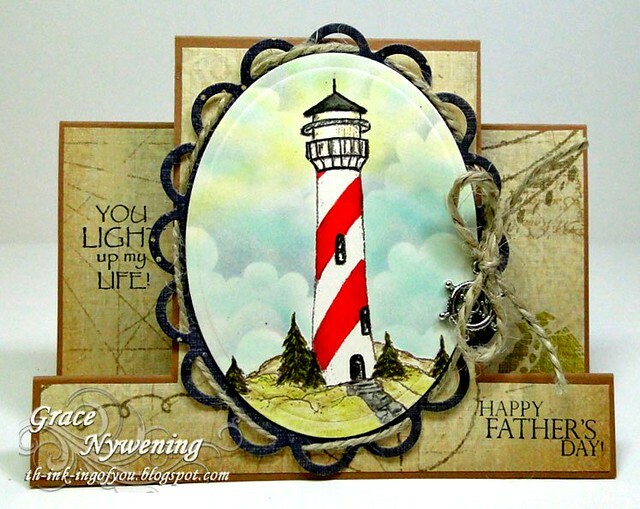 If you are doing a whimsical card, the scallops are fun, but if you are doing a more realistic scene, it's nice to use the layering technique I described. 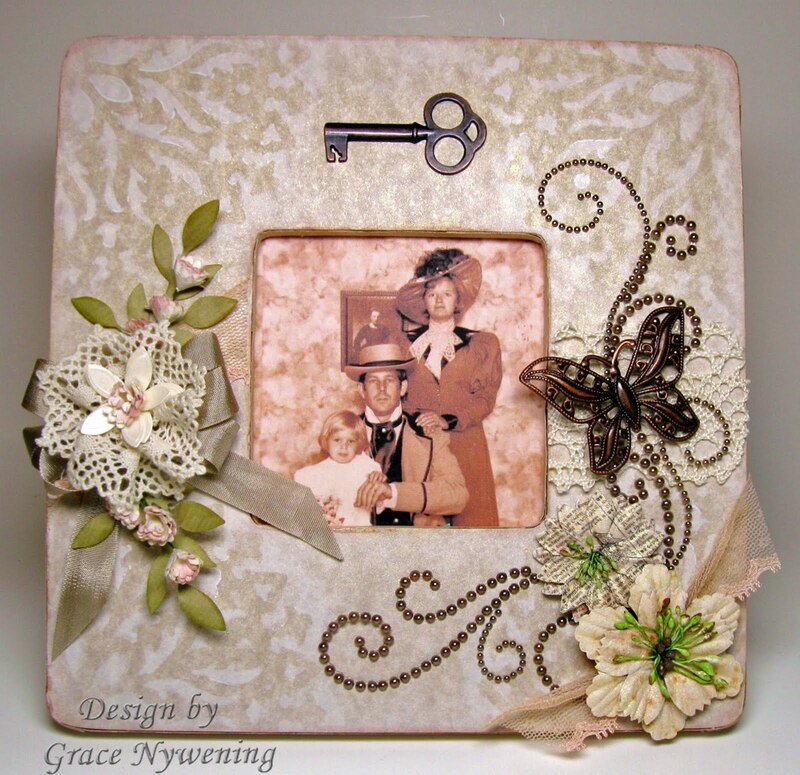 I cut the oval with a Spellbinders Classic Oval Large, and the frame with the Lacey Oval, both of which can be cut at the same time using the Grand Calibur! I then simply laced some twine through the frame and added a ship's wheel charm. I stamped two sentiments from the set directly on the dp. Thanks for stopping by! I love to hear from you and so appreciate your sweet comments! 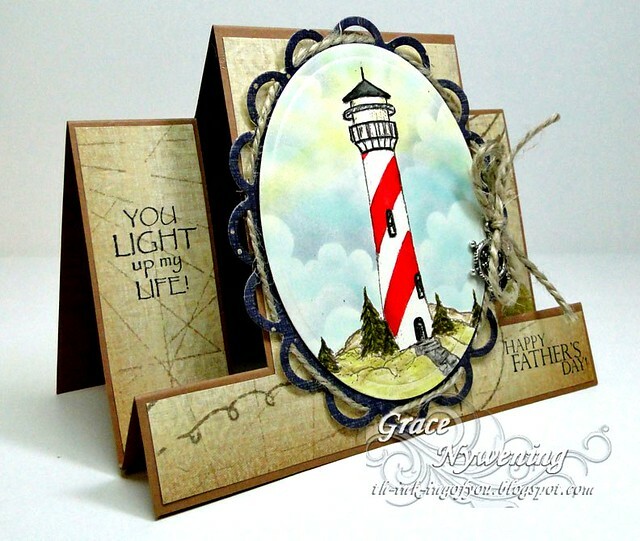 For more pictures of this card style, please see THIS post! Hello blogging friends! Today it's my turn to present the "Time With" blog post on the Our Daily Bread designs Blog, and I am sharing a project that I made using this month's release from Our Daily Bread designs, Randi's Song. If you have not read the story of how this set got it's name, please see this post. It will touch your heart! Anyway... on to my project. 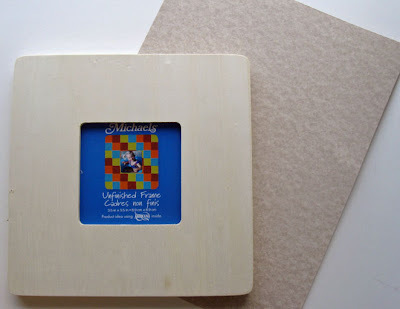 I bought two of these shadowbox frames at Tuesday Morning last week and I wish I had gotten more! I had more fun altering it! I began by applying some yummy green flocked dp to the inside of the frame. It's so rich! It and the dp on the outside of the frame are from "Me and My Big Ideas - Harvest" 12 x 12 pad. 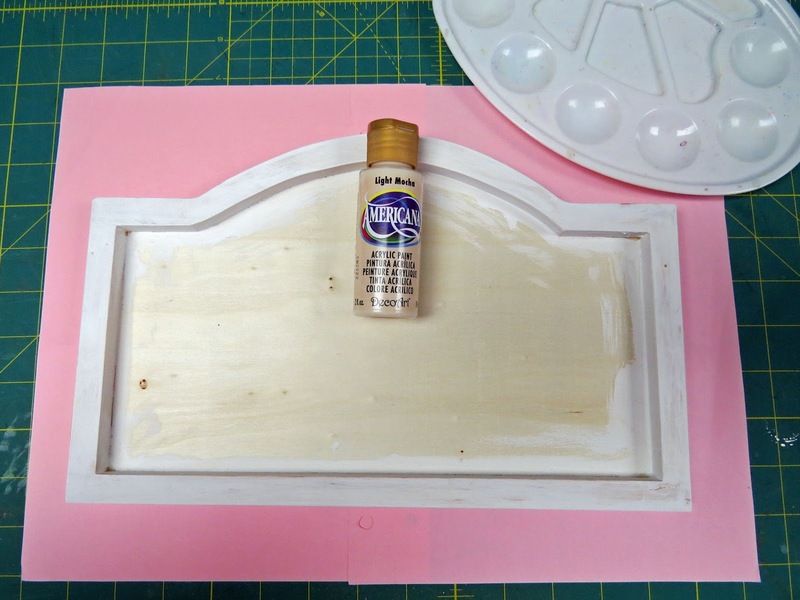 I then painted the sides and all edges of the frame with Adirondack Espresso Paint. 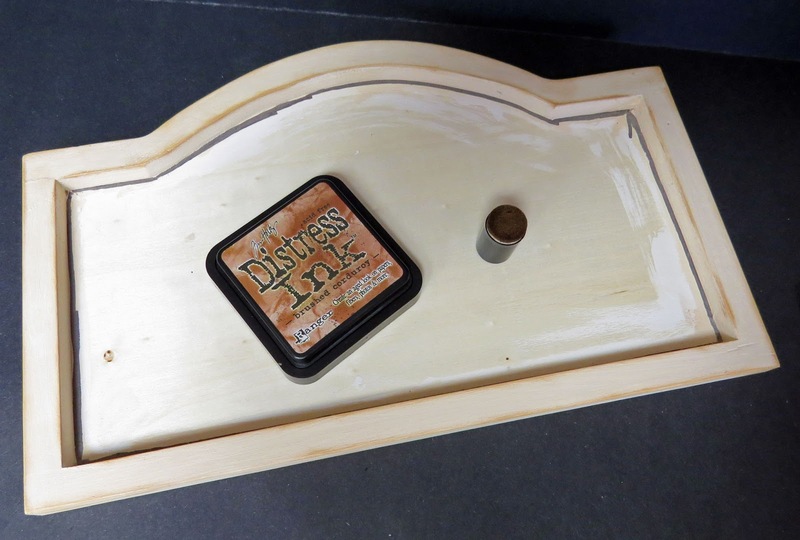 Once the paint was dry I adhered the dp to the front of the frame. I used a craft blade to cut out the inside opening. 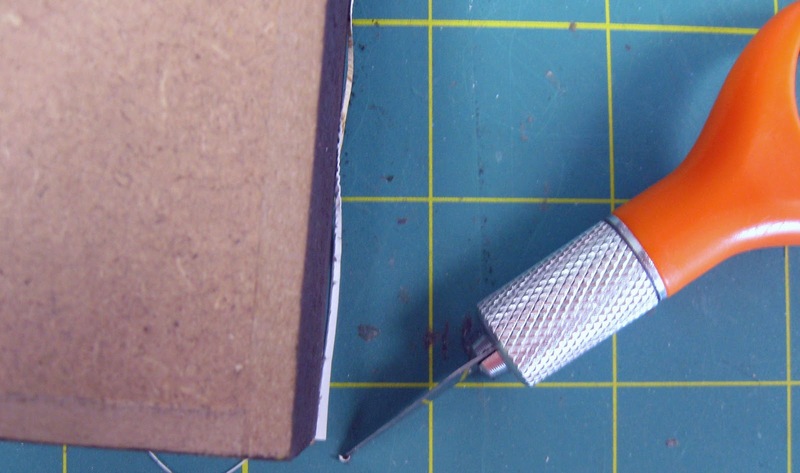 I found the corners first, marked them, cut an "X" and then used the blade to follow right along the edge. After trimming the center square of dp, I turned the frame over and trimmed any excess off the front from the back side, using the edges as my guide. Once the frame itself was covered with designer paper and/or paint, I started to work on all my components. 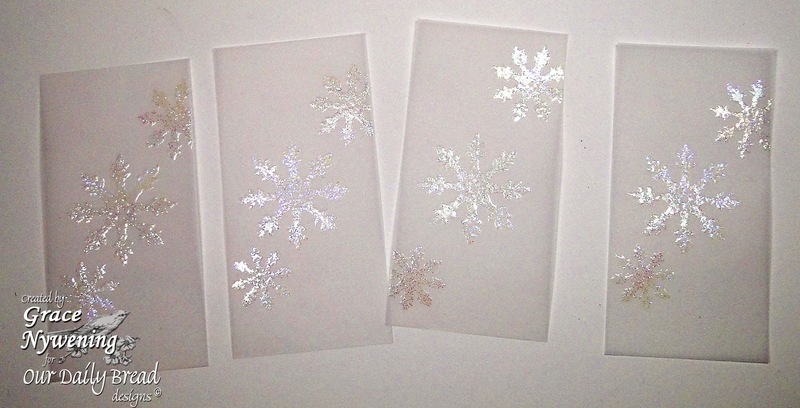 The first thing I did was make three different designed papers with Adirondack Alcohol Inks. I was inspired by the beautiful job Julie did for our blog hop using alcohol inks and decided to use them for my leaves. So I made three sheets using different combinations of Sunshine Yellow, Meadow, Sunset Orange, Cranberry, and Butterscotch. I used Gold Mixative for all three and then used blending solution, all on glossy card stock. I then stamped the large leaf stamp from Randi's Song, with Black Stazon Ink and then cut out. I used a fine mister to lightly wet the back of the leaves. I did not scrunch them up like I would on regular card stock because with the glossy coating I didn't want it to separate. Instead, when the paper was wet enough to fold easily, I started just molding it, using the vein lines as center points for most of the folds, then just molded the leaves until I liked the way they looked. I then dried them with my heat tool. They dried very stiff. 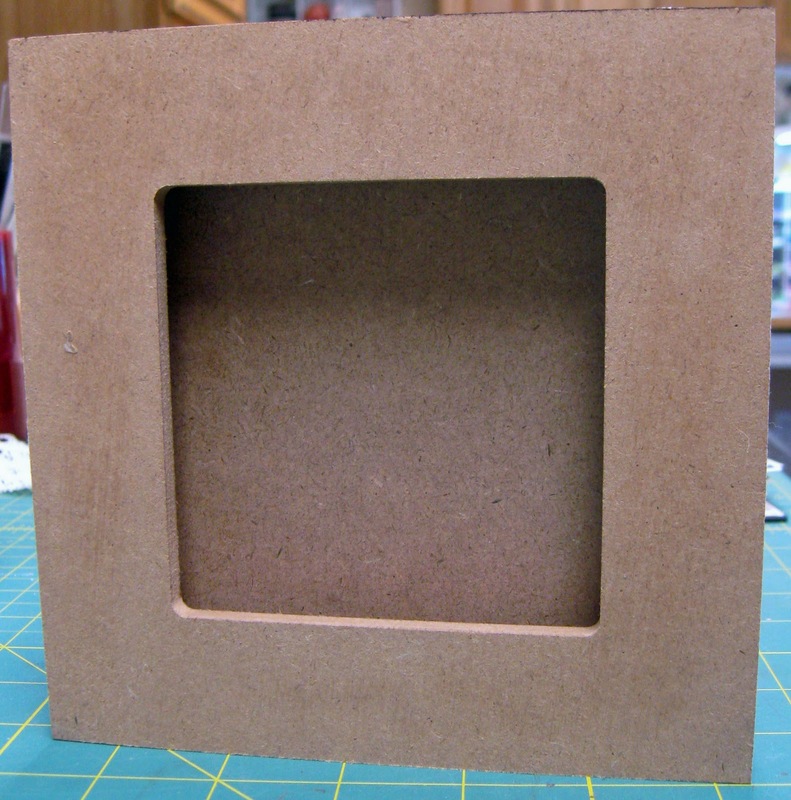 In the photo below, you see my frame is ready to decorate and I have added a square of foam to the inside. This is where my sentiment will be placed popped up for dimension. I stamped the words to the hymn, "Great is Thy Faithfulness" with Versfine Onyx Black on Papertrey Vintage Cream, cut it with my Spellbinders Classic Square die small and matted with a piece of the alcohol inked paper I had created, then one mat of Bazzill. 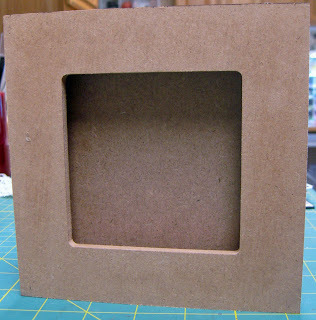 I used thick foam to pop the whole panel up off the backing of the shadowbox. Now for the fun part. 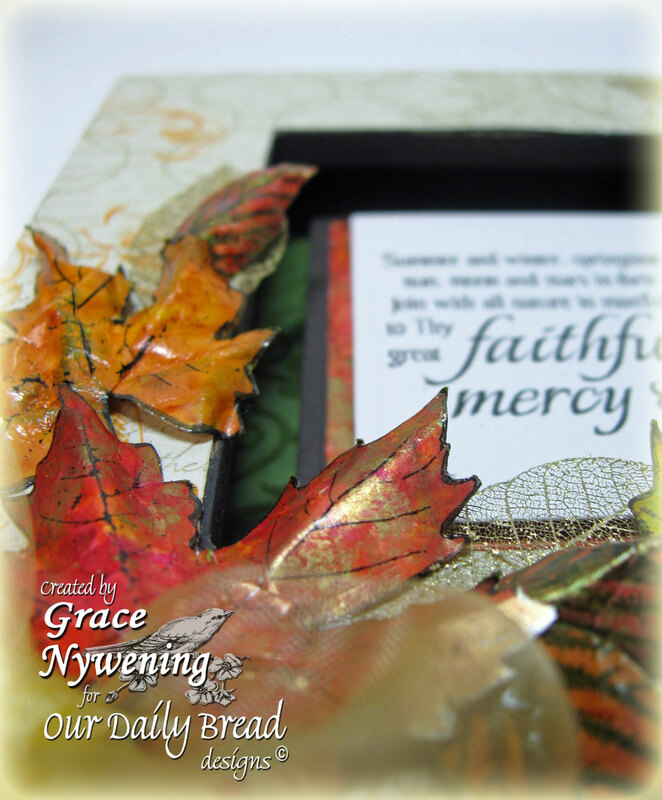 I decided to add a few pretty gold filagree leaves from a Recollections pack as backing for my leaves. I then arranged the leaves and adhered with a hot glue gun. The bow is made of gold sheer May Arts ribbon. I have decided to make several of these as gifts if I can find more of these shadowbox frames! It was a fun project... a little time consuming, but well worth it! I hope you enjoyed my project and that it might inspire you to try something other than a card with your new stamps!. Here is a close up of the leaves and how dimensional they are after being molded while wet. 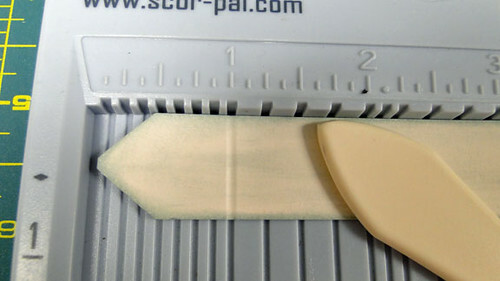 Adhesive that will glue paper to wood: good glue stick, Xyron, TomBow, etc. I started with this unfinished wood frame from Mikael's that I got for $1.00, and a piece of marbled card stock that I have had for ages so I have no name for it, but I chose it because it had some marbling for interest, but not a lot of pattern to compete with my stencil. 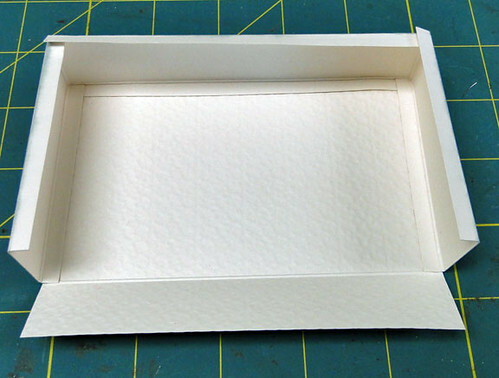 I removed the "center" materials, laid the frame face down on my designer paper. With a pencil I traced the lines of the outside of the frame, and the inside opening. Then I cut along those lines with a craft blade. I used a glue stick to adhere my dp to the front of the frame. 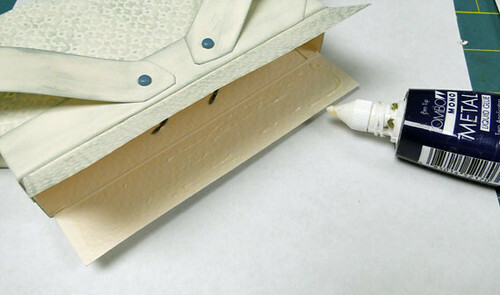 If you have a Zyron, you could use that or even a good quality spray adhesive. After adhering it, I used my Fiskar's finger blade to trim right up against the edges. I love the finger blade because it allows you to get so close with great control. I then measured the depth of my frame and cut strips of dp to exactly fit the edges, and adhered with Tombo Metal Glue... it holds great! Again, you could just as easily have painted the edges of your frame and only added dp to the front if you wanted. 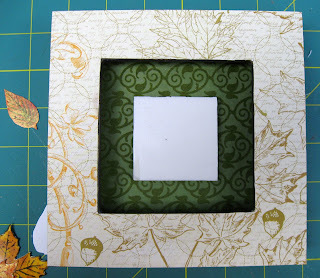 Next I laid my stencil on a corner of my frame, lining up the center of the medallion with the corner of the frame. 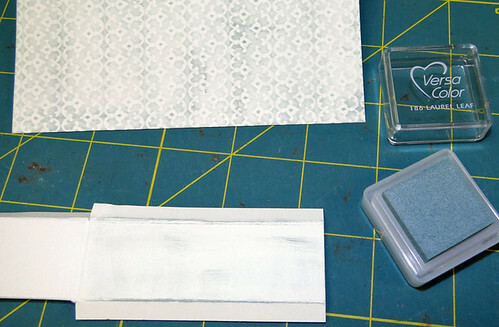 Using Craft White Ink and a make up sponge, I began sponging on white ink. I worked from the corner out to the outer edges of the stencil. I added more in places to give almost a shadow effect, but that's all just a matter of taste. There is no right or wrong. You can always add more, so start with a light touch and go from there. When I reached the outside of the pattern, I lifted the stencil and continued sponging on more white ink farther out from the medallion, filling in the middle part of the frame lightly. 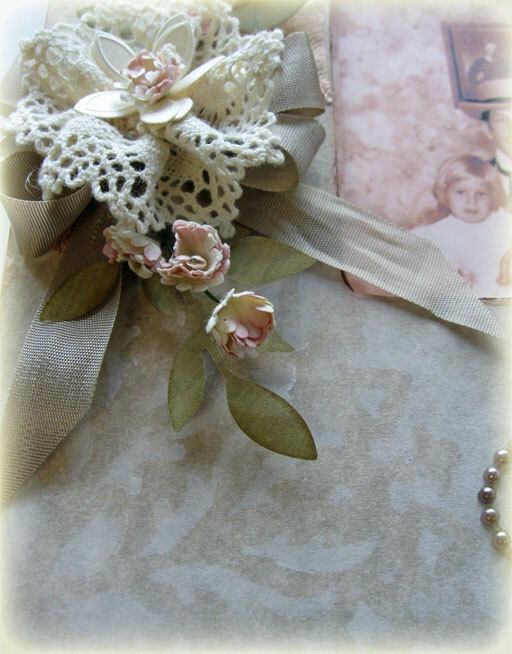 It is just enough to give a "dreamy" feel to the frame, rather than harsh lines between stenciled pattern and dp. 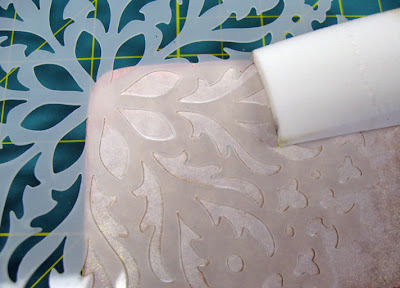 Here is a close up view of the stenciled pattern over the dp. I continued this process on all four corners, sponging lightly some white in the space between the corners as well. Next I just started to embellish it. I used snippets of 3 different laces, some Prima Flowers, ZVA Creative Pearls, a Leaf Die Cut from Sizzix, taupe silky ribbon from Martha Stewart, and I made one lace collar for a paper flower by cutting a 9" length of lace, sewing a loose running stitch so I could gather it up into a circle, and then stitched the seam together. 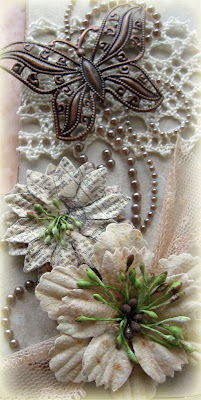 Through that I slipped two shimmery paper flowers and a little silk Prima.The key is from K&Co. The butterfly is a bronze piece from the jewelry dept. at Hobby Lobby. Have fun with it and if you make one I'd love a link so I can see it too! 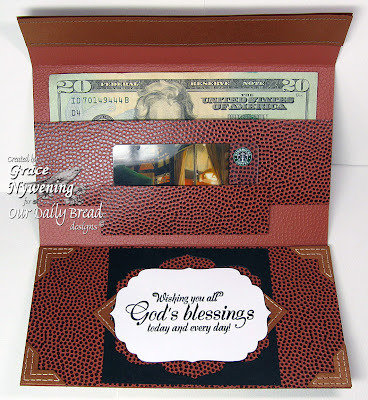 I stamped sentiment from Our Daily Bread designs "Thinking of You" set in VersaColor Black and clear embossed and cut with Spellbinders Label #4. I do hope you have enjoyed this tutorial, and that it was understandable. I loved the versatility of this one. I made this long before the faux leather technique was spotlighted on SCS but that would be a great way to do this as well instead of the basketball dp I used. So many possibilities! Have fun! If you make one I'd love a link to it so I can see it! Looking at your work I feel the presence of Our Father. For He is good and merciful. Ask and you shall receive, which shows.